Sadly, the man couldn’t see God’s hand in the answer! It was not the way he thought God should answer. Proposition: Today, I want to speak about unexpected ways in which God brings about ‘Divine Appointments’. Let me leave with you 4 areas (I’m sure there are more), where this can happen. Some of them may seem like negative situations, but God will always come through for us! Thereafter, on Elisha’s instructions, she had left her home & gone to Philistine territory to avoid a 7 year famine (2 Kings 8:1-2). Now that the famine was over, she had come back, 7 years later, only to find to her dismay, that the house & land no longer belonged to her. Some Bible commentators believe that the land had either been seized by the Government, or that someone may have encroached on the land & forcibly taken it over. It so happened that when she entered & cried unto the King (2 Kings 8:5), he was having a ‘spiritual’ chat with Gehazi, about all the things Elisha had done (2 Kings 8:4-5). Amazingly, at that very moment, Gehazi was telling the King about how God, through Elisha, had raised this very same lady’s son from the dead (2 Kings 8:5)! Talk about ‘Divine Appointments’! The shocked King may have been speechless for a while! The King in his surprise then asked the lady whether this was true & she affirmed it (2 Kings 8:6). After all, there’s nothing better than a first hand account! It was truly an ‘Unexpected Divine Appointment’. The end result was that she not only got her house & land back, but also the income from the land for the past 7 years! I wonder whether any bank has that kind of payback scheme! In life, God sends many unexpected people across our path. We meet them in supermarkets, concerts, funerals social functions etc. 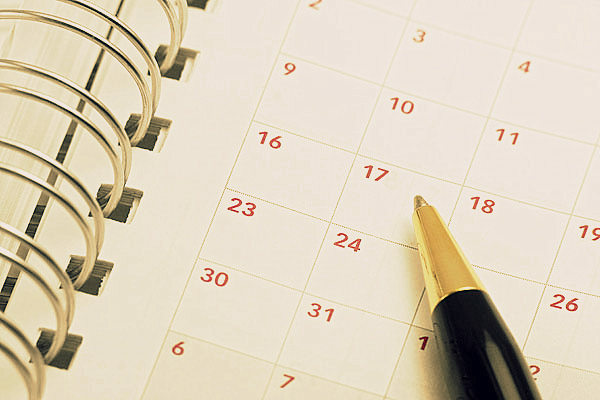 Many times, we may consider such meetings as irrelevant or even as irritants to our busy schedule. But, could it be many times that God is sending them to us unexpectedly, as a ‘Divine Appointment’, either as a blessing for them, or, maybe even for us, as it happened for the lady in 2 Kings 8? Such meetings are also blessed opportunities to share the Gospel. I once received an unexpected call from an unknown person, who was not a believer, who wanted to meet me immediately. It was a Saturday afternoon & since Sunday was a busy day, I was looking forward to a time of rest, before preparing for the Sunday. I was therefore not too keen to meet anyone at that time (shame on me! ), & tried my best to encourage him to see me the following day at church, after service. However, since he kept insisting, I had to forget about my rest time & meet up with him. As he entered, his first words, said roughly were, ‘I want to know about the Lord Jesus’! Sensing then that this was a ‘Divine Appointment, I began to share the Gospel with him. After I finished, this tough looking guy was more than willing to open his heart to the Lord. Are you staggering in an unexpected crisis right now? Crisis situations don’t warn us before they hit, do they? However, it may be leading you to a ‘Divine Appointment’. In 1 Samuel chapter 29, God had just helped David & his men to get out of what was a difficult situation in having to fight their own countrymen. In chapter 30, as they returned home, obviously with much thanks for God’s intervention, an unexpected crisis had struck. Their home city, Ziklag, had been raided & torched by the Amalekites (1 Samuel 30:1). To make things worse, their families had been taken captive (1 Samuel 30:2). In the midst of the unimaginable sorrow they were feeling, David’s faithful men were even talking of stoning him (1 Samuel 30:6)! However, in this crisis situation, the Bible says, ‘David found strength in the Lord’ (vs 6). As he did so, God had begun to turn the crisis into a ‘Divine Appointment’. Under God’s direction (1 Samuel 30:8), David began to pursue the enemy. Eventually, in a vast land area, he miraculously found the very person who could lead him to the raiders (1 Samuel 30:11). This was the dying servant of an Amalekite official who had been deserted, since he was sick & a burden (an unexpected meeting?) Since David spared the man’s life, he was more than willing to lead them to the raiders’ camp (1 Samuel 30:15). As a result, David & his men won a great victory before any harm could come to their families. They also received much, much more than what they thought they had lost (1 Samuel 30:18-20). An unexpected crisis can truly be turned into a ‘Divine Appointment’ by the Lord. At the age of 24, I faced an unexpected crisis as I developed a serious problem on my spine that needed surgery. I spent 25 days in hospital & life as a whole & my future looked bleak. God had however planned a ‘Divine Appointment’, & many, many years later, thanks to His touch , I still haven’t had any surgery on my spine & am doing fine! No one likes delays. We live in an instant world, filled with instant food, instant noodles, online banking, quick promotions, quick turnovers & rapid solutions. Any delay therefore, is uncomfortable. God however, has his own timing in our lives & he can turn the delays into ‘Divine Appointments’. In the book of Esther, we read in chapter 2 vs 21-23, about how Mordecai uncovered an assassination plot on Xerxes, the King of a mighty Empire. As he revealed the details of the plot to the King through Esther, the conspirators were apprehended & the King’s life was saved. But, what was Mordecai’s reward? NOTHING! He was forgotten. The only reward he got was that with this incident, his name was recorded in the chronicles of the King (Esther 2:23), an action that would have great significance later. Mordecai, like any other man I’m sure, would have been rather disappointed. Wouldn’t we, if we had helped save the life of our Nation’s Leader? But, Mordecai kept serving faithfully. At a later date, when Mordecai was about to be hanged on a large gallows the following morning, due to a conspiracy by a wicked official named Haman (Esther 5:14), God planned a ‘Divine Appointment. It so happened that according to chapter 6:1, the King couldn’t sleep that night. ( Some believe that he couldn’t sleep because the construction of the gallows was creating a loud din!). Since there was no TV for the King to watch a reality show, no radio to listen to his favorite talk show or no other entertainment available at that time of night, the best thing he could do was to read about his exploits (Esther 6:1). The record of his rule was therefore read to him. As the officials started reading, it was no coincidence that they turned to the story of how Mordecai had saved the King’s life (Esther 6:2). When the King asked what reward Mordecai had received (Esther 6:3), the officials would have replied sheepishly, ‘nothing’. Man may forget, but God never forgets! Immediately, the King planned a rewards scheme for Mordecai (vs 4-11), and of all people, Haman was chosen to do the honors! As a result, not only Mordecai’s life, but the entire Jewish race was eventually saved from possible destruction! The delay had been turned into a ‘Divine Appointment’. Trust God therefore through the delays of your life. You may just be on a verge of a ‘Divine Appointment”. I’m sure you have made some good plans for your life. Most people do. But sometimes, plans get changed suddenly, due to circumstances that intervene. At times, God brings change in His wisdom. Of course, nobody enjoys change, but if we could trust the Lord in the midst of change that may be uncomfortable, we may well see a ‘Divine Appointment’. In Acts 8, Philip was in the middle of a revival at Samaria and a desert excursion was hardly on his mind. Similarly, in Acts 10, Peter hadn’t dreamed of ever going to a Gentile home to preach. God however changed their plans. Philip was able to teach the scriptures to a palace official from Ethiopia and ended up baptizing him. Peter saw a powerful revival in the gentile home of Cornelius. Only eternity will reveal the full results of these changes that God ordained. I was mentored by a wonderful man of faith, the founder Pastor of our church, Rev. Colton Wickramaratne. In his autobiography titled ‘My Adventure in Faith’, in chapter 42, Pas. Colton tells of how once he was on a ministry tour of the USA and was scheduled to attend a function in a particular city. 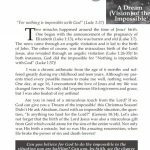 On his way however, God impressed him three times to go for a meeting of a well known preacher, that he saw being advertised. While he couldn’t understand the change of plan, he obeyed the voice of the Lord. Eventually, he found himself, (thanks to the help of a Pastor friend at the event), on the stage of the well attended meeting. When it was nearing time for the sermon, his Pastor friend came up to him and mentioned that the advertised preacher was unable to be at the meeting that night. He then asked whether Pas. Colton could preach the message to the crowd that was present! The change of plan had turned into a ‘Divine Appointment’! So, whether you’re faced with an unexpected meeting or going through an unexpected crisis, an unexpected delay or an unexpected change of plan, God may just be preparing you for a ‘Divine Appointment’. Trust Him through every season of your walk of faith. Let me close with a quote the Lord impressed into my heart. 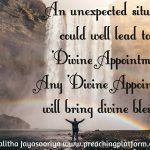 “Any unexpected situation can be a ‘Divine Appointment’. Any ‘Divine Appointment’ will bring divine blessing”. So so blessed!! Thank you Pastor for this very encouraging article. May God bless you to reach out more so many will be blessed! Blessed in deed. This is the year of God’s divine appointment. The sermon has really blessed me. Thanks for the encouraging comments Justus. Glad you were blessed. Amen.was strengthened by this sermon. Thanks Ps Romesh. Glad to know the sermon was a blessing to you.